Many pastors of smaller churches have given up on growing their churches. They have read most of the church growth books and articles but still failed to grow their churches. If you are in this same predicament, please read on. As a pastor and Church Growth consultant, Pastor Albert Kang might be able to help you. He believes that it is not mere church growth information that you need. Church growth ideas are a dime a dozen. He believes that you need hands-on skill training. Think about you trying to learn how to drive a car by reading books and articles about driving. It does not work that way. You need a driving instructor. Pastor Kang will be willing to visit you and work with you for a period of hands-on training. He will share with you tailor-made practical skills and techniques to increase your church attendance and also how to build a strong discipleship base. Pastor Kang will use his experience in planting 16 churches to help you succeed in your church. 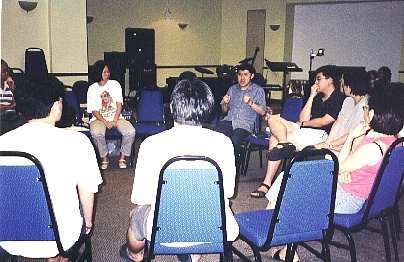 He has personally grown a church in Singapore from 23 people to 1,700 in less than six years. He has also pastored for 3 years in the Philippines, working with the poor farmers in a Filipino barrio.His other experience was to raise a church in Phnom Penh. He has also launched a church in Pennsylvania, USA. This wide range of experience will mean that he is able to evaluate your church situation, whether your church is in the village or city, and work with you on how best you can grow your church. For example, Pastor Kang spent about four months training a Malaysian pastor whose small-town church was having an average of 38 members for over seven years. Three years after the church growth consultancy, this church is having a regular Sunday's attendance of 150 people. The pastor is now excited about the possibility of his church growing to more than 500 people. Please call or write to Pastor Kang and he may be able to give you church growth advice through emails or letters. If necessary, he will visit your church and work with you so that you will succeed in growing your church. that are worth our life.